With the fight going on in the South between the slaves and their masters, the slaves (in mind) have become home-born slaves as it is written (Jer. 2:14). They love their master and desire to be their master’s kin in the line of true brotherhood. This is the truth which cannot be hidden in these modern times. The intelligent people and the college university graduates are poisoned 100 percent more in mind and into the love of the enemy than the uneducated. It is no wonder that the scriptures say the poor gladly receive the truth after being offered heaven at once from Almighty Allah (God) Himself. According to Black men’s actions and rejection of Allah and the true religion, Islam, which means entire submission to the will of Allah, they will take all kinds of humiliation. They are beaten and killed by the White man (the real citizen and owner of the land) while trying to force him to admit them (the once slaves) as equals to the White race. I have taught for years that you cannot demand the White man accept you as his equal or as his brother, because he is intelligent enough to know that you are not his equal and that you are not his brother. Even if you go back to Adam—he is not the Black man’s father. We are not all compatible. Adam is the father of the White man. This is known. The suffering of my people in trying to force themselves on the White man in the South and elsewhere as their brothers and sisters is to be pitied. I, for one, have true love for them, and I pity them. But I cannot help them when they deliberately walk away from God. 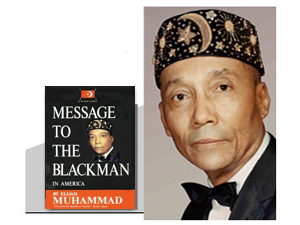 By their deeds and acts they indicate they would rather help the enemy, the murderer and those who hate them than help God Almighty, Whose proper name is Allah and who came in the person of Master Fard Muhammad and to whom praises are due forever. The best and most intelligent way is to give Caesar what is Caesar’s and let us go for ourselves on some of this earth that we can call our own, just as did the White people. When Europe was overpopulated, they found expansion in the Western Hemisphere. If we want freedom, justice and equality, we must look for it among ourselves and our kind, not among the people who have destroyed and robbed us of even the knowledge of ourselves, themselves, our God and our religion. We have a world of Muslims under Allah and His religion, Islam. The White people do not teach you this because it points the way to your freedom and equality. It is a shame that our people are beaten and killed because of their ignorance in wanting to be White people, while there are billions of people on the face of this earth who look like them but only 400 million White people on our planet earth. Our population runs into billions, and the earth belongs to us. 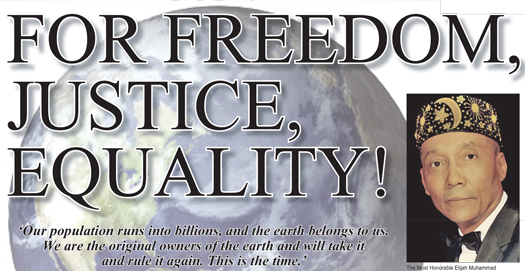 We are the original owners of the earth and will take it and rule it again. This is the time.